www.infochangeindia.org is a leading cross-sectoral online resource on social justice and human rights issues in India. The site is updated daily, with news, views and analysis on a wide range of issues such as women and child rights, poverty and livelihoods, governance, environment, public health, education, agriculture and food security. The website is managed by professional journalists and development analysts with a strong commitment to social justice and social change through dissemination of information. It receives over 70,000 visitors. The content is linked, cited and reproduced by hundreds of organizations worldwide. Scores of documents are downloaded every month, and used as discussion papers and for further research and analysis by policy makers. It also has dozens of stories of change from the grassroots, a vibrant film forum that features some of the best documentaries on social justice issues in India/South Asia and Kids for change – a section raising awareness of social justice issues amongst the 11-14 age group. The initiative demonstrates that ICT could play a significant role in dissemination of information relating to social justice and change. This would strengthen civil society by enabling citizens to marshal facts, opinions and perspectives on rights and development issues, so that they can participate in drawing up an agenda for a more equitable and sustainable world. Infochangeindia empowers activists, students, researchers, development analysts, policymakers and concerned citizens by giving them pertinent, timely and useful information on development and rights issues, all in one place and catalyzing thereby discussion, debate, build action networks on these issues and advocacy speedily and at nominal cost. ManoramaOnline.com, Kerala’s no. 1 news and entertainment portal, is from the 118-year-old Malayala Manorama Co. Ltd. It has emerged as the unique voice of Malayalees across the globe. The content is in English and Malayalam. The portal has 62 million page views a month thanks to its rich content ranging from politics and lifestyle to business and religion. The news channel is its strong point. It also has interactive programmes like chat, discussion forum and opinion poll. Also on offer are services like e-mart, e-paper, stock & commodity tickers, e-greetings and live cricket scores. Manorama Online’s revamped version combines a distinct Kerala flavour with an international outlook. It is also expanding its services into new Internet-enabled areas like mobile and digital content. The portal has channels like movies, music, lifestyle, health, religion, astrology, women, education, children, travel, cuisine, photo gallery, campusline and ‘she’ and a variety of interactive features like free mail, chat, discussion forum and opinion polls. It not only connects the community, but also gives insight of those living outside India. 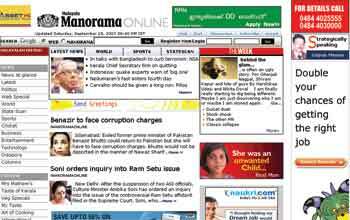 www.manoramaonline.com has responded to the changing times not only in content, but has also adapted to new technology progressively with a youthful vigour. The promoters could see the emerging picture almost a decade ago, when it motivated its employees including senior journalists to take to computers and discard old methods of publishing newspaper and magazine. Marrying its rich and long experience of running information business with ICT has made it efficient as well as effective. Use of ICT has helped it to enlarge its offering on a single place and provide information in three formats-static, dynamic and interactive-to engage and disseminate information to an audience living inside as well as outside Kerala without incurring too much recurring cost. www.odisha.com, is the world’s first Oriya news portal with international standards and was started on 26th of November 2004. It has been bringing out 24×7 news from eastern Indian state of Orissa and related to Oriyas across the globe. It has brought a revolution in Oriya journalism by introducing international standard of writing and best regional language content practice. 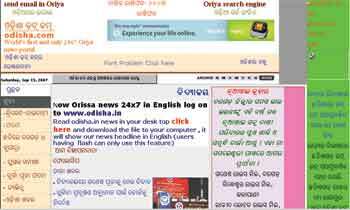 Odisha.com is a news portal completely in Akruti Oriya dynamic fonts. It is not just a news portal but also an initiative to involve non-resident Oriyas in the process of development and to save Oriya language that is facing threat from increasing use of English by Oriyas living outside Orissa. Orissa is often described as most backward and underdeveloped making headline for hunger death, child sale and poverty, although the state has received significant foreign investment. The initiative aims to connect about 1.4 million Oriyas living outside with those residing in the state. Odisha in the past two years has received over 80 lakh hits and its visitors come from 50 countries around the globe. It is not just a news portal but also an initiative to involve non-resident Oriyas in the process of development of the state and to save Oriya language that is facing threat from increasing use of English. It also attempts to make state residents closer to them by introducing ‘Odishara Bandhu’ (friend of Orissa) column where near about a thousand people have registered. The portal has highlighted various initiatives by non-resident Oriyas as well as by those who reside in the state. Orissa is a state where the Broadband Internet Service was introduced much before anywhere in India. The government has planned to make available such facilities in local Panchayat level in the coming years. Odisha’s reach would grow playing a catalyst in the state’s development and empowering of its people.